The construction works for the project reached the 20% mark as of May 2015. Image courtesy of Civil Engineering Construction Corporation No.4 (Cienco4). The construction of the bridge’s three main piles was completed by 479 JSC in August 2015. Image courtesy of Civil Engineering Construction Corporation No.4 (Cienco4). TenCate supplied 23.5km of its proprietary TenCate Geotube containers for constructing the two work platforms. 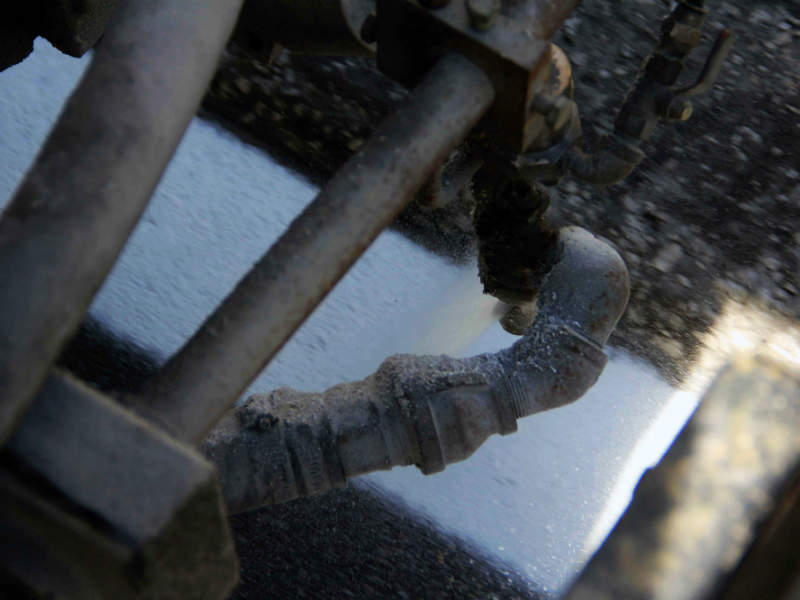 Image courtesy of TenCate. The new highway will link the Hanoi-Haiphong Expressway at the Tan Vu Interchange (Western approach) in Hai An District to the new Lach Huyen Port (Eastern approach) in Cat Hai Island. The Vietnamese road project is expected to reduce the travel time between the two ends from the current 2.5h to just 15min. "The Vietnamese road project is expected to reduce the travel time between the two ends from the current 2.5h to just 15min." 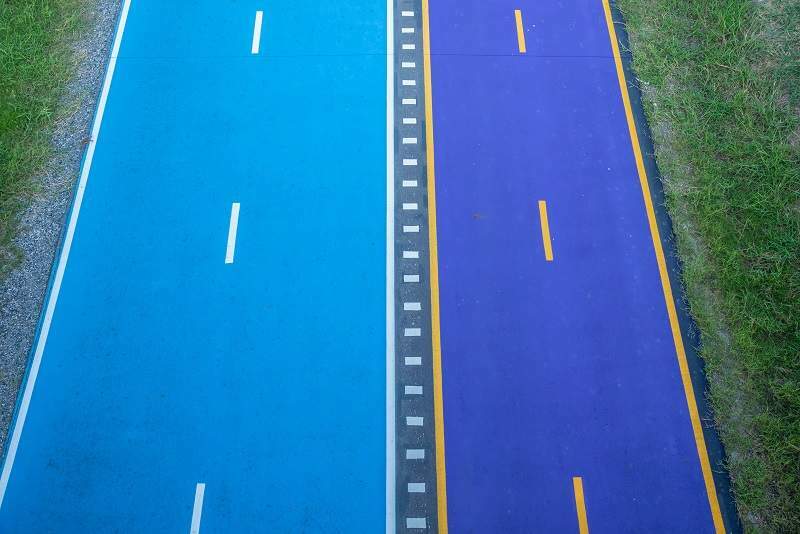 The integrated highway and bridge project is being developed by the Vietnamese Ministry of Transport (MOT), and the Directorate for Roads of Viet Nam (DRVN). The project management service is being rendered by Project Management Unit No.2 (PMU2), a subsidiary of DRVN. The environmental impact assessment (EIA) report for the highway project was approved by Vietnam’s Ministry of Natural Resources and Environment (MONRE) in October 2008, whereas the separate EIA report for the bridge was approved by the MOT in May 2010. Construction started in February 2014 and the project is scheduled for completion in 2017. 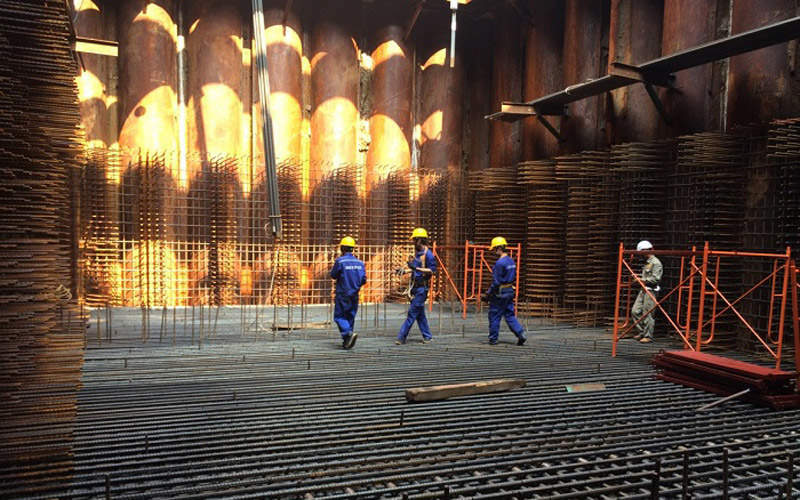 The project forms an ancillary infrastructure of the larger Lach Huyen Port Project, which involves the construction of a new deep seaport for the booming northern region of Vietnam. The port project is being overseen by the MOT and Vietnam Maritime Administration (VINAMARINE). The port is being constructed to ease the cargo handling capacity of the existing Hai Phong Port and Cai Lan Port and address the region’s future demand in cargo volume, which is estimated to reach 100 million tonnes by 2020. The 10.19km road will be 29.5m-wide, while the 5.44km bridge will be 16m-wide and comprise 84 spans, supported by piers. The bridge will accommodate four lanes and two safety corridors. The highway and bridge are both designed for a top speed of 80km/h. The bridge on the western approach will be 4.4km-long, the main bridge traversing the combined estuary of the Bach Dang River and Cam River will be 0.5km-long and the bridge on the eastern approach will be 0.5km-long. 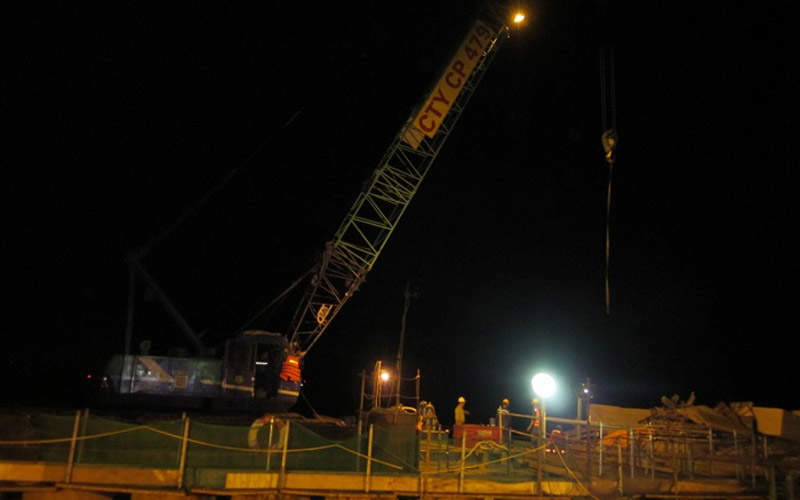 Construction works for the bridge necessitated the reclamation of two 26m-wide each work platforms measuring a combined 4.1km-long and construction of an associated dredged spoil containment facility. The general contractor for the project is the joint venture of Civil Engineering Construction Corporation No.4 (Cienco4), Truong Son Construction, and Sumitomo Mitsui Construction, who is responsible for the bridge construction. Nippon Koei performed the project’s feasibility study and the detailed design, and also prepared the bidding documents for the project. It is further involved in providing construction supervision. 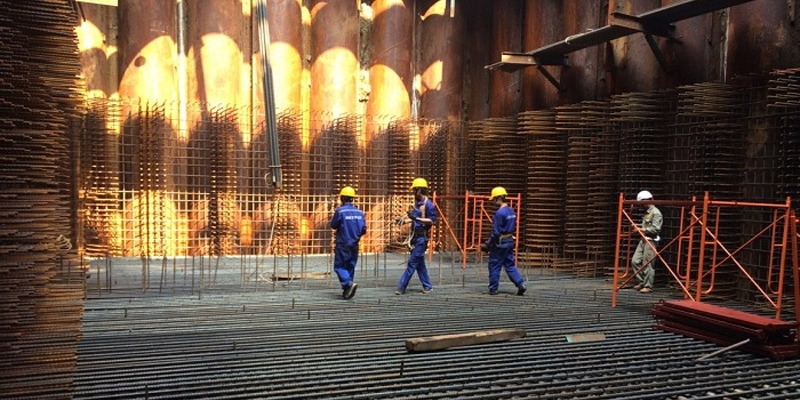 The steel pipe piles and steel pipe sheet piles for the bridge’s foundations were supplied by Nippon Steel & Sumikin Pipe Vietnam (NPV) under a subcontract from Sumitomo Mitsui Construction. 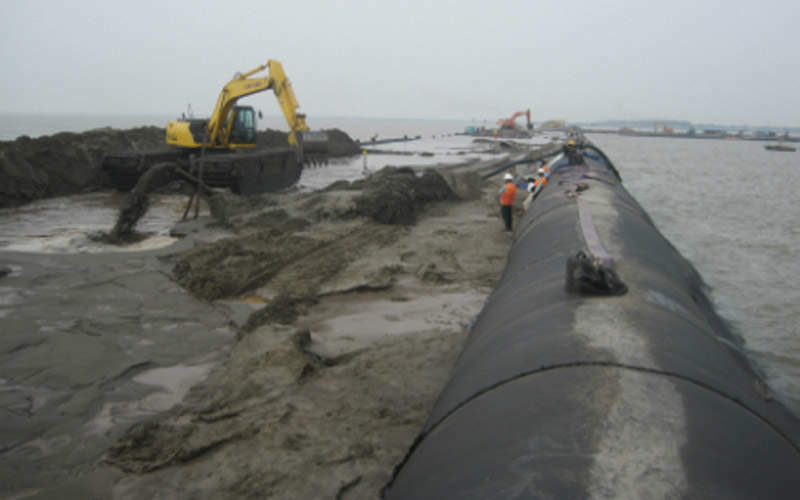 Sumitomo Mitsui Construction further subcontracted Port Technology Construction Consulting and Commercial (PTECH) to perform the onshore and offshore geotechnical investigation and the pressure meter test (PMT) work for the project. The eastern approach road is being constructed by Fecon. The construction of the bridge’s three biggest piles was completed in August 2015 by 479 JSC. TenCate supplied 23.5km of its proprietary TenCate Geotube containers, each measuring 50m-long and varying in diameter between 4.6m and 9.5m, for the two work platforms. The overall investment in the project is estimated to be VND11.8t ($554m approximately), of which VND10t ($470m approximately) is being provided by Japan International Cooperation Agency (JICA) through its ODA loan. The remaining is being financed by the Vietnamese government.